Hawley was among numerous elected officials urging the governor to step down following a House investigative report graphically detailing Greitens extramarital affair. Testimony in the report allegedly slapping, grabbing, shoving, and other sexually aggressive acts. 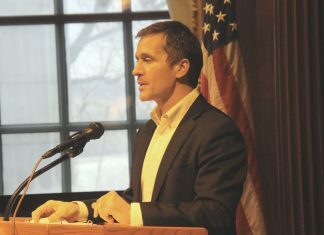 “The House Investigative Committee’s Report contains shocking, substantial, and corroborated evidence of wrongdoing by Governor Greitens,” Hawley said last week. “The conduct the Report details is certainly impeachable, in my judgment, and the House is well within its rights to proceed on that front. But the people of Missouri should not be put through that ordeal. Governor Greitens should resign immediately,” Hawley said following the release of the report. The Attorney General’s Office is currently investigating campaign ties between Greitens and The Mission Continues, a veterans charity founded by Greitens. In March, 14 subpoenas were issued relating to the investigation. The investigation is centered around the use of charities donor list and the use of an email address for campaign-related business. The Mission Continues has denied any involvement.